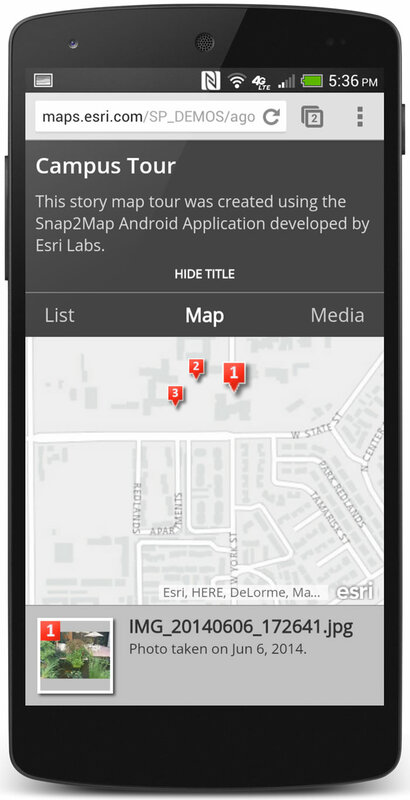 You can now author an Esri Story Map Tour app using the new Snap2Map app on your smartphone and publish it using your ArcGIS Online account. The published app can be viewed on a smartphone, laptop, or another device. 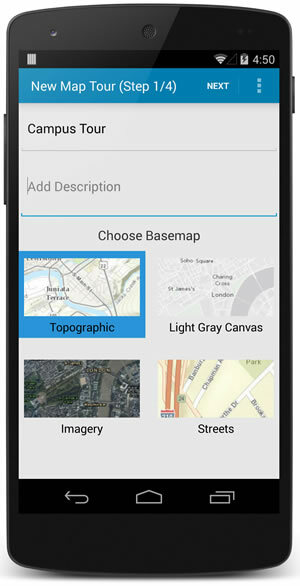 Snap2Map is available as a native app for iOS and Android devices such as smartphones and tablets. You can download the free app from the Apple App Store or Google Play. Snap2Map's interface is streamlined and easy to use. Just type in a description of your Map Tour and select a basemap. "Snap2Map makes it easy to create beautiful Story Map apps right from your smartphone using geotagged images," says Krishnaprasad Jagadish, lead developer of Snap2Map. "Choose the photos, edit captions, and upload and share your content as a fully interactive Story Map Tour app in just a few simple steps." Snap2Map works locally on your mobile device even when it is disconnected from the Internet, enabling use in remote areas or wherever else Internet connectivity is spotty. Just take your photos and then add text describing each photo. You can type or use your smartphone's voice-to-text capability to add the descriptions. Next, select a basemap such as World Topographic, Light Gay Canvas, Imagery, or Streets. 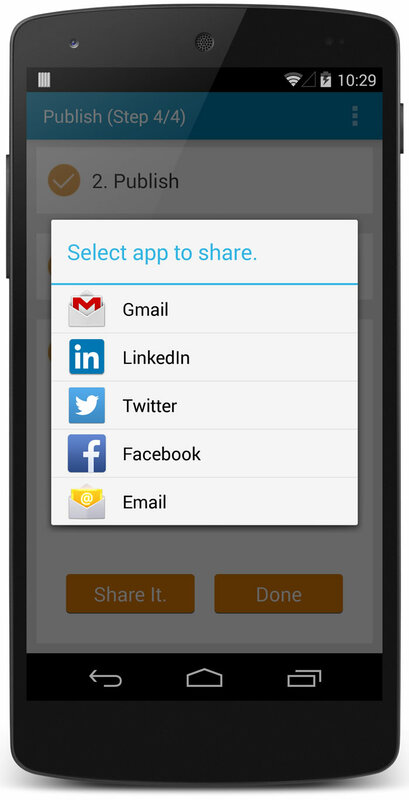 With Snap2Map, you can save and edit your collected content on your smartphone. Make sure the Snap2Map app is allowed to capture coordinates when you take your photos. This enables the software to automatically place the photo on the map. On the iPhone, this is controlled by enabling Settings > Location Services and the Settings > Privacy > Location Services > Snap2Map slider. Once uploaded, use the Story Map Tour Builder app to make further edits with your personal computer in ArcGIS Online. Take advantage of the integrated ArcGIS platform and use the tool best suited for your preferred workflow. From start to finish, Snap2Map requires no coding and enables you to use your smartphone to create a complete Story Map Tour app. The software will place photos on the map if you've turned on your phone's location services. The last step: Share your Story Map with others. With both Snap2Map and Map Tour Builder you can adjust locations by manually placing photos on the map. The Snap2Map app creates an ArcGIS Online folder called Snap2Map, where it places the Story Map Tour web map and application. Snap2Map can control access to your Story Map Tour app from the smartphone, allowing public, organizational, or private viewing—whichever is appropriate for your needs. 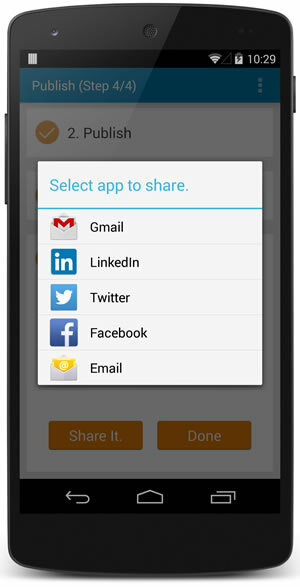 You can then share via e-mail or social media. Once published, you can share the application via e-mail or Twitter or other social media. 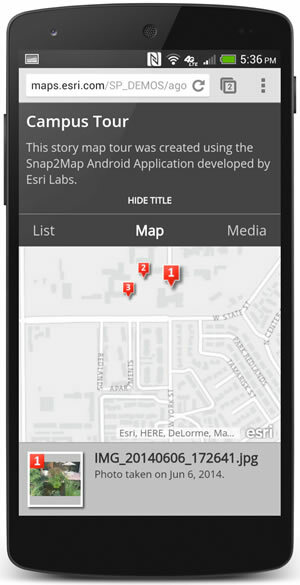 Learn more about the Story Map Tour App. Esri Labs is Esri's cutting-edge prototype software foundry. Like all software from Esri Labs, the Snap2Map app does not include technical support. 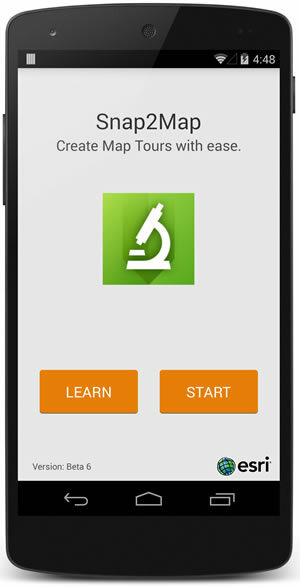 The Story Map Tour app and its associated Map Tour Builder app, however, are supported through Esri Technical Support. Snap2Map includes a detailed help section. Follow Snap2Map on Twitter @Snap2Map and Esri Labs @Esrilabs.